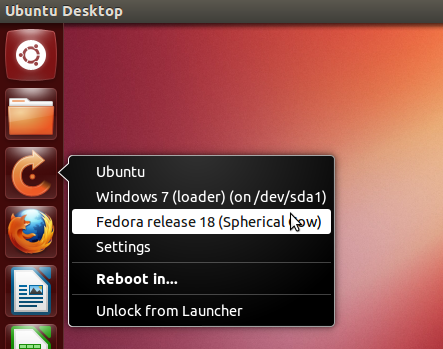 Today I've updated Unity Reboot to work with the latest GRUB 2.0 available in Ubuntu 12.10 and 13.04. Unity Reboot is a custom Unity launcher that can be used to quickly reboot into a different OS / Linux distribution, useful for those who dual boot (or triple boot or... it should work with any number of operating systems, including Windows, various Linux distributions like Ubuntu and Fedora, etc.). This isn't just for Unity and it should also work with docks that support Unity quicklists, like DockBarX, Cairo Dock or Plank. This is how it works: selecting an entry from the quicklist, the system will reboot and that entry will be selected in the GRUB menu. That means you can still boot to a different OS if you change your mind. You can set the GRUB menu timeout to 0 and you won't see the GRUB menu and instead, the system will directly reboot into the selected OS. This only applies for that system restart (so only one time) and after that, the first boot entry should be selected, like it is with the default GRUB settings. The GRUB menu has changed starting with Ubuntu 12.10 and the various options for an OS (like old kernels for Ubuntu) are displayed in a sub menu which isn't displayed by default, so I've had to tweak Unity Reboot to work with this new GRUB 2 menu. The new version also uses pkexec (so you'll get a nice password prompt in GNOME Shell for instance) instead of gksu for the reboot command. You can select to reboot without having to enter your pasword, by right clicking the Unity Reboot launcher icon and selecting Settings > Don't ask for password on restart (for the settings, gksu is still used and not pkexec). Unity Reboot only works if Ubuntu (the installation on which you're using Unity Reboot) has been installed after the other operating systems. So for example, if you triple boot Windows 7, Ubuntu 12.10 and Fedora 18, Unity Reboot will only work if Ubuntu 12.10 was the last you've installed from these 3 (basically, it needs to run on the Linux distribution that has installed GRUB). The latest Unity Reboot 0.2 is only available for Ubuntu 12.10 and 13.04, but an older version is also available in the same PPA for Ubuntu 12.04, 11.10 or 11.04. If you want to get the code and tweak it to your needs, you can get it via GitHub (it uses simple bash scripts and YAD for the settings dialog). Don't worry, this command won't reboot your system. 3. Now you need to add the Unity Reboot launcher icon on the Unity Launcher (or a dock that supports Unity quicklists). To do this, open Nautilus, press CTRL + L (so you can type the location), enter "~/.local/share/applications" without the quotes in the Nautilus location entry (or manually navigate to "~/.local/share/applications") and drag and drop the "Reboot in..." icon to the Unity launcher / dock. In the settings, you can set Unity Reboot not to ask for a password when rebooting in a different OS. Warning: if you disable the password prompt, the system will reboot as soon as you select an OS from the quicklist, without any confirmation dialog. I've tested Unity Reboot on my laptop on which I dual boot Ubuntu 13.04 and 12.10 as well as in VirtualBox with triple boot: Windows 7, Ubuntu 12.10 and Fedora 18. If you encounter bugs, please post them in the comments below.